Batman on Wheels Captures Joker and Harley Quinn! Evil is the new Chic! To make the choker you take a purse strap and some stick on velcrow. To make the Corset u take a red tshirt and some purple felt cut the shirts sleeves off and then cut it down the middle. Sow the purple fabric in the middle and so some black straps so they go all the way around the red shirt. For the hat you can find the template online. The skirt was found at goodwill all you do to make it bloody is splatter paint it with red paint. You can use any type of purple fabric to make the mask! 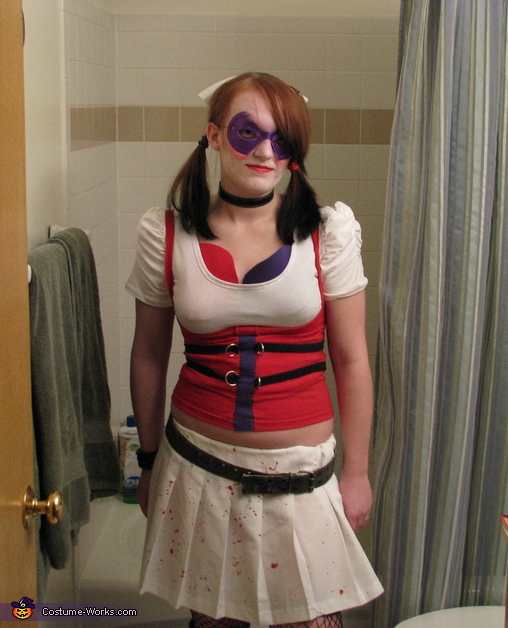 and Viola your Harley Quinn!! This is one of the best! You did an awesome job!